Flame Wardens are more than fireball-throwing mages. They are also the protectors of the Eternal Flame, which resides deep within their guild hall. They believe they must ensure that the Eternal Flame lights the world forever, for without it, the Age of Frozen Darkness will descend. As Flame Wardens, they also carry a piece of the Eternal Flame with them at all times. It is this fire which serves as the initial power source for their abilities. May our fire burn eternally. With it, we will cleanse the land of enemies. 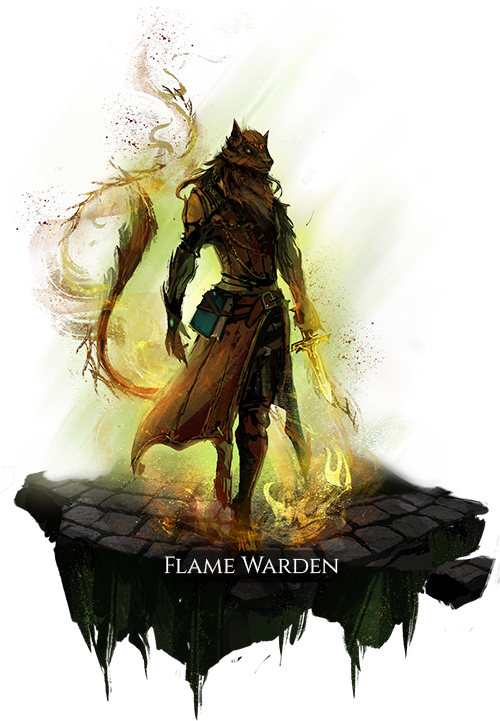 Deals high direct fire damage, and applies a fire debuff that deals moderate fire damage over time for a brief duration. A long-range direct projectile that tracks toward a hostile target and builds additional Pyroclastic Overcharge. A large, slow-moving, arcing projectile with a long activation time that explodes on impact and deals bonus damage to structures and deployable objects. Immobilizes the caster, and grants increased power to fire magic abilities based on the current amount of Pyroclastic Overcharge. Expends all remaining Pyroclastic Overcharge power and blood to increase the power of the user’s next spell cast. The user’s body explodes when they die, dealing damage based on remaining Pyroclastic Overcharge power to nearby enemies. This also applies a fire debuff that reduces movement speed and increases ability activation and recovery times for a brief duration.